^ San Juan and its barrios. 美国人口普查局. 2000年 [2007-05-02]. ^ Magaly Rivera. 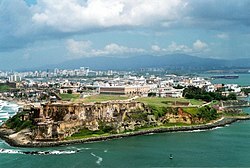 San Juan Capital City [圣胡安首府]. Welcome to Puerto Rico. [2007-05-02] （英语）. ^ the San Juan Port [圣胡安港口]. 波多黎各港口管理局. 2007年 [2007-05-09] （西班牙语）. ^ About Puerto Rico [关于波多黎各]. Puerto Rico Tourism Company. 2007年 [2007-05-08]. ^ NOWData - NOAA Online Weather Data. National Oceanic and Atmospheric Administration. [June 27, 2013]. ^ Station Name: SAN JUAN L M MARIN AP. National Oceanic and Atmospheric Administration. [2014-05-13]. ^ WMO Climate Normals for SAN JUAN/ISLA VERDE INT'L ARP,PR 1961–1990. National Oceanic and Atmospheric Administration. [2014-03-10]. ^ Monthly Averages for San Juan, PR – Temperature and Precipitation. The Weather Channel. [2011-04-16]. ^ Online Directory: Puerto Rico, Caribbean. Sister Cities International. 2007年 [2007-06-25]. （原始内容存档于2008-02-28） （英语）.